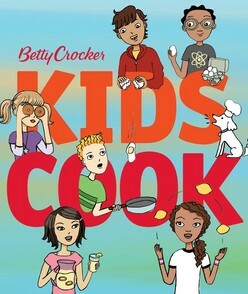 Betty Crocker has been helping kids in the kitchen since 1957 with the publication of Betty Crocker’s Boys and Girls Cookbook. Betty Crocker Kids Cook provides the same blend of teaching and creativity, helping today’s kids learn to cook and have fun at the same time. The book has 66 I-want-to-make-that recipes, plus engaging illustrations and photos of each recipe that blend whimsy and practicality. The book covers Breakfast, Lunch, Snacks, Dinner and Desserts as well as kitchen essentials, including cooking safety and nutrition basics. This is the book that will teach kids to feel comfortable in the kitchen, whether assembling a healthy snack like Strawberry-Orange Smoothies or whipping up a dinner of Impossibly Easy Mini Chicken Pot Pies with Fresh Fruit Frozen Yogurt Pops for dessert.